A native of London, Ontario, Joel Tangjerd began cello studies at the age of 4, and piano studies at the age of 5; achieving an ARCT in Cello Performance and Grade 10 in piano from the Royal Conservatory of Music, a Bachelor of Music and a Master of Music from Western University. He is currently pursuing a Doctorate in Historical Performance at the University of Toronto. Joel has received scholarships to attend the Kincardine Summer Music Festival, the Southern Ontario Chamber Music Institute, the Tafelmusik Baroque Summer Institute, the Domaine Forget Music and Dance Academy and the Oberlin Baroque Performance Institute. He was also a finalist in the LMSF competition and the winner of the Maritsa Brookes Concerto competition at the Don Wright Faculty of Music. He was formerly the organist and music director of St. Luke’s Anglican Church. 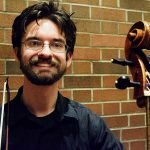 Joel has studied cello with Lisa Burroughs, Susan Millar, Julia MacGregor, Thomas Wiebe and Christina Mahler; piano and theory with Sandra Young Tangjerd. He was formerly the principal cellist in the London Youth Symphony under the direction of maestro Len Ingrao and has served as principal cellist of the University of Western Ontario Symphony Orchestra under maestro Alain Trudel.